A reputed PB course certainly lived up to its reputation – the Brass Monkey half marathon. 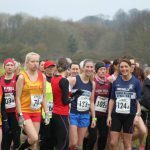 Ever popular, selling out within hours, the fast course, and superb running, delivered PBs for several Strollers on Sunday. John Cook achieved yet another PB and was first Stroller home in 1:16:25 – John is having a wee reflection before, I’m sure, he’ll return to get that magical sub 75; class running! Mark Anderson was next in a superb 1:18:30 and Chris Dwyer 3rd with a PB of 1:21:14. Brilliant running boys! Ritchie Gerry was 2nd V50 in 1:22:08, showing us that we can’t play the age card – Ritchie is running better now than when he was a slip of a lad, excellent! Wendy Chapman was first home, and 1st FV45 overall, for the ladies in 1:27:54, followed by Hasina in 1:40:34, a PB, with Lyne 3rd Strollette, 1:41:46, and second FV60 overall. Well done, quality running as always! Sunday was also the date for the Cathedral Relays at Durham. Although many were down at York, we still saw some great running. Ashleigh Bennett, Dawn Elliot and Rachel Ball ran good legs to finish an impressive 16th team overall. The vet men had Terry, Dale and Harry running very similar times, 12:32, 12:21, and 12:21, to take position 36. Well done to you all, and to each and every Stroller who turned out for the club, great team spirit, as always, supporting each other every step.